Velar SVAutobiography Dynamic Edition’s Manufacturer Suggested Retail Price starts from 447,720 AED. The car will be available for purchase in the second half of 2019, with local market retailers accepting orders now. 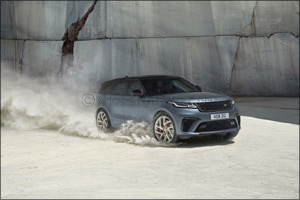 Dubai, United Arab Emirates, 5 February 2019 – Land Rover has given the world’s most beautiful mid-size SUV more performance, luxury and exclusivity with the introduction of the limited run Range Rover Velar SVAutobiography Dynamic Edition. Designed as the pinnacle of the Velar line-up, the new model has been developed by Land Rover Special Vehicle Operations and is powered by a 550PS 5.0-litre V8 supercharged engine with a range of unique design enhancements. Adding to its exclusivity, this distinctive model will be available to purchase for one year only. Velar was named World Car Design of the Year at the 2018 World Car Awards and is the second model in the Range Rover family to wear the coveted badge, after the introduction of the Range Rover SVAutobiography Dynamic in 2017. With a supercharged V8 engine, the most powerful Velar accelerates from 0-100km/h in 4.5 seconds (0-60mph in 4.3 seconds) and is capable of 274km/h (170mph), while cosseting customers with traditional Range Rover refinement and comfort. Dynamic Edition mixes the personality of a performance car with the go-anywhere capability of a luxury mid-size SUV. The powerful new model is distinguished by a range of visual enhancements and unique trim finishes, delivering a more purposeful appearance and heightened attention to detail while maintaining Velar’s perfectly optimised proportions and distinctive silhouette. On the outside, the award-winning mid-size SUV features include a new front bumper with larger air intakes to feed the V8 Supercharged engine and cool the uprated braking system. A new grille and lower side mouldings combine with a revised rear bumper featuring integrated quad exhaust finishers. The exterior changes combine with a transmission tunnel undertray to ensure the fastest Velar in the range cuts through the air more efficiently. Even the Range Rover lettering on the bonnet and tailgate has been enhanced, with a knurled finish on the metal element of the two-piece letters adding a fresh degree of sophistication to the exterior. The SVAutobiography Dynamic Edition is also the only Velar available in Satin Byron Blue – a metallic paint finish from Special Vehicle Operations’ Premium Palette range – and all models feature a contrast Narvik Black roof as standard. The larger wheels support the performance focus of the SVAutobiography Dynamic Edition, helping to generate more grip and accommodating larger brakes. Its 395mm front and 396mm diameter rear brake discs feature a two-piece construction to optimise weight. The innovative designs also dissipate heat more effectively to cope with the higher braking forces generated during high performance driving. The extra stopping power is highlighted by red brake calipers (four-piston at the front, sliding at the rear) which feature Land Rover lettering. Gloss Black calipers are also available for a more discreet appearance. The purposeful exterior is matched by a heightened sense of luxury inside with a carefully curated combination of trim finishes and upholstery. The twin-stitched, perforated and quilted Windsor leather is unique to the SVAutobiography Dynamic Edition and adds to the sense of luxury inside. Customers can choose from four colour combinations (Ebony, Cirrus, Vintage Tan and Pimento) and the SVAutobiography Dynamic Edition features 20-way adjustable heated and cooled front seats with memory and massage functions as standard. The special touches inside extend to the unique sports steering wheel, which features a specially contoured rim and tactile aluminium gear shift paddles. Lower down, the rotary gear selector and circular control dials for the seamlessly integrated Touch Pro Duo infotainment system all feature a sophisticated knurled finish. An optional carbon fibre pack for the interior adds a more contemporary feel to the cabin, with a distinctive steel weave, while sports pedals and illuminated metal treadplates with Range Rover script complete the look. The individual SV elements extend to the 12.3-inch Interactive Driver Display featuring unique ‘digitally knurled’ dials which deliver an expertly handcrafted sense and finish to the digital experience inside the mid-size SUV and a bespoke SVAutobiography Dynamic start-up screen. This digital detailing continues with the electronics that underpin the driving characteristics of the new flagship Velar model. Calibrations for the AWD system, Active Rear Locking Differential, eight-speed transmission, steering and air suspension have all been honed and are bespoke to the SVAutobiography Dynamic Edition; delivering a more focused driving experience. Engineers at Land Rover Special Vehicle Operations spent 63,900 hours fine-tuning the unique calibration to optimise the ride, handling and responsiveness. The work of Special Vehicle Operations focused on delivering increased breath of capability, maintaining Land Rover’s renowned all-terrain expertise while providing new levels of dynamic control and performance. Aside from far-reaching electronic tuning, upgraded anti-roll bars reduce body roll during hard cornering and the revised set-up for the Continuously Variable Dampers works in combination with firmer air springs for the air suspension to deliver the ultimate balance of composure and comfort. The AWD system has been uprated too with a transfer box capable of withstanding the higher loads generated by the 5.0-litre supercharged V8 engine. The advanced Intelligent Driveline Dynamics system precisely and imperceptibly distributes engine torque to suit the conditions. The set-up can direct as much as 100 per cent to the rear depending on the conditions. Speed-sensitive Electric Power Assisted Steering is fitted as standard, minimising effort at parking speeds but delivering precise and direct control at higher speeds, while the Velar’s Dynamic mode has been enhanced, optimising the steering, suspension and transmission settings to suit more enthusiastic on-road driving. The unique character of the Velar SVAutobiography Dynamic Edition is also reflected by its bespoke exhaust set-up, which provides a soundtrack to match its performance. SV’s Variable Active Exhaust System features valve technology to optimise the exhaust note, depending upon the driving conditions, and provides Velar with an unmistakable V8 rumble. The active set-up is 7.1kg lighter than the standard design and its increased gas flow helps to unlock some of the flagship model’s increased performance. The Velar SVAutobiography Dynamic Edition sounds like no other SUV, but the most driver-focused model in the range is as practical as ever. The generous boot capacity is unaffected, while the flexible 40:20:40-split rear seats allow customers to vary the loadspace depending on their requirements. The 82-litre fuel tank also promises a genuine range in excess of 483km (300 miles). The new Velar SVAutobiography Dynamic Edition is available in six exterior colours: Firenze Red; Santorini Black; Corris Grey; Fuji White; Indus Silver and, by special order, Satin Byron Blue. Manufacturer Suggested Retail Price in UAE for the Velar SVAutobiography Dynamic Edition starts from 447,720 AED. The car will be avilabile for purchase in the second half of 2019, with local market retailers accepting orders now.